Lt. Gov. Byron Mallott has resigned. Here’s what that means for the Nov. 6 ballot. With three weeks until Alaska's general election, Lt. Gov. Byron Mallott abruptly resigned Tuesday over "inappropriate comments" he had made. Mallott, a Democrat, had been running for re-election with Gov. Bill Walker, a Republican-turned-independent. So what does Mallott's resignation mean for the Nov. 6 ballot? Walker remains in the governor's race, according to his campaign. Mallott's name will remain on the ballot, despite his resignation, said a statement from the Alaska Division of Elections. That's because the ballot had already been certified and printed by Tuesday, and the elections division had already sent more than 20,000 ballots out to voters, said Samantha Miller, division spokeswoman. Just over 1,000 of those ballots had been voted and returned, according to the division. Under state law, candidates must withdraw at least 64 days before the election. "Under the Alaska Constitution, a vote for governor is considered a vote for the lieutenant governor running with him or her," said the statement from the elections division. "Even if a lieutenant governor withdraws, the gubernatorial candidate may remain on the ballot," it said. 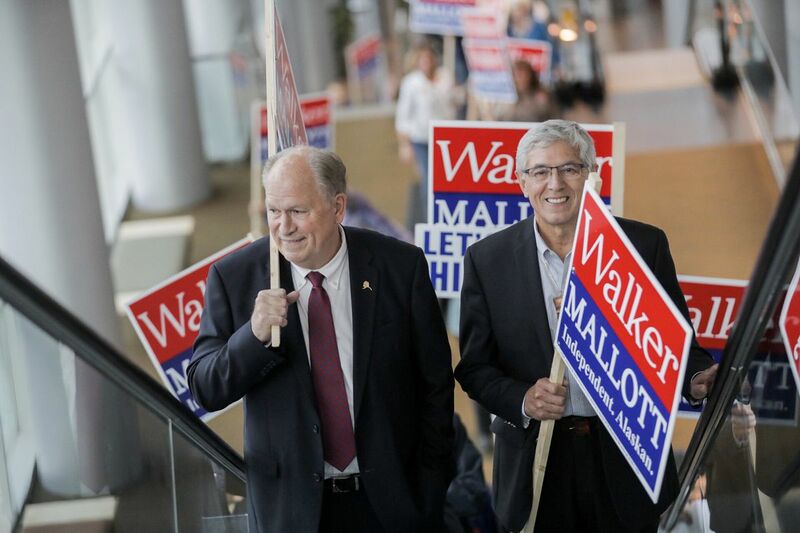 "Accordingly, if Governor Walker is re-elected, Byron Mallott will technically be elected along with him." However, given Mallott's resignation, Walker would be able to appoint a lieutenant governor if he is re-elected, the division said. Walker would appoint Valerie Nurr'araaluk Davidson, said his campaign manager, John-Henry Heckendorn. Davidson was sworn in as the new lieutenant governor Tuesday after Mallott's resignation. She had served as commissioner of the Alaska Department of Health and Social Services up until then. Davidson's party affiliation is listed as "other," according to state voter registration data. Heckendorn said Davidson was "progressive." Walker is in a three-way fight for governor with Democratic candidate Mark Begich and Republican candidate Mike Dunleavy. Libertarian candidate Billy Toien is also running for governor.